You can’t have too many Christmas gift drives in a growing region like Macarthur. Three such drives have been launched over the past week and there are a few more to come. Wests Group Macarthur started the ball rolling when it announced it had joined forces with Big Yellow Umbrella this year to collect and deliver 1,000 Christmas gifts for local families in need. They have compiled a list of up to 1,000 Macarthur children who are in care, in crisis situations, are victims of domestic violence or their family is struggling financially. “Wests invites our wonderful members, guests, staff and the wider Macarthur community to support this Giving Tree appeal so that we can all share a little magic this Christmas,’’ a spokesperson said. Xmas Giving Trees have been set up in the reception of Wests League Club Campbelltown and Country Club Gledswood Hills, where members, guests or any community member can choose a gift tag from the tree to purchase a gift for a specific gender and age until November 30. Alternately members of the community can just purchase a gift for a child of any age and gender and drop it into any of the Wests Group venues; Wests League Club, Country Club Gledswood Hills, Lakeside Golf Club Camden and Wests Tennis Club. All gifts should be donated unwrapped; they will be wrapped by a team of volunteers including Wests’ staff on December 4 and distributed via Big Yellow Umbrella’s community networks. Two Christmas toy drives were also launched this week by local Labor members of parliament, Greg Warren and Dr Mike Freelander. State Member for Campbelltown (pictured left) Greg Warren’s annual Christmas Toy Drive will run until Thursday, December 13. All toys collected will be donated to Macarthur Gateway, who will in turn pass them on to local families doing it tough. Donations can be dropped off at Mr Warren’s electoral office located at Shop 3, 72 Queen Street, Campbelltown. 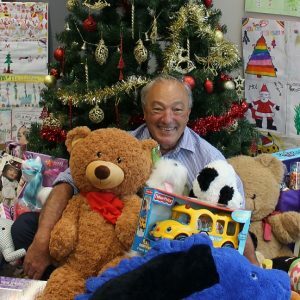 “My annual Christmas Toy Drive aims to support the work of some of our fantastic local organisations and charities, providing gifts for local children who would otherwise go without,” said Dr Mike Freelander, the federal member for Macarthur, pictured below. 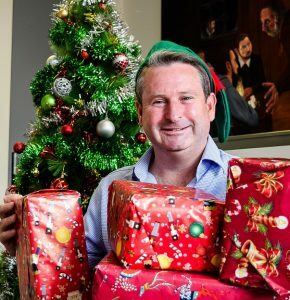 Donations of unwrapped gifts can be made at Dr Freelander’s office, 37 Queen Street, Campbelltown, during normal opening hours Monday to Friday. “I thank Macarthur residents and businesses for their generosity and support,” Dr Freelander said in launching his third Christmas toy drive.